Luffy wrote this story and was read by 265 people. For free. 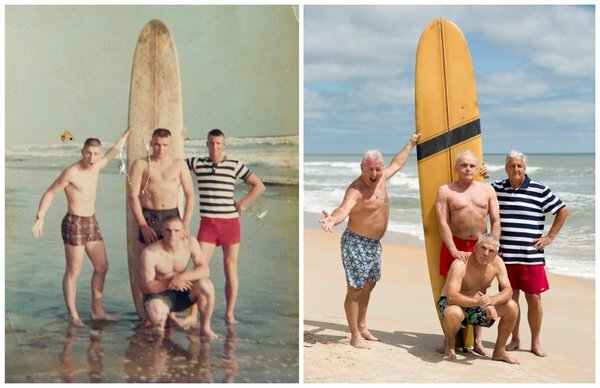 Somewhere in the middle of a Florida beach this weekend, four Marine veterans huddled together around a standing yellow longboard and gazed into the camera. To anyone passing by, it probably seemed like any other old photograph. But for these Vietnam War vets, it was an unforgettable reunion – and a chance to recreate a moment they’d shared about 50 years ago. “Bob Falk, 71, wearing a mirror-image blue-and-white striped shirt, leaned against the longboard's left side, resting his spare hand on his hip. Dennis Puleo, 69, removed his shoes, revealing the feet scarred by shrapnel, and pulled off his shirt, flanking the longboard on the right, mugging a wide smile for the camera with his arms extended.